The La Salle volleyball team came out with all guns blazing in its Northwest Oregon Conference opener. 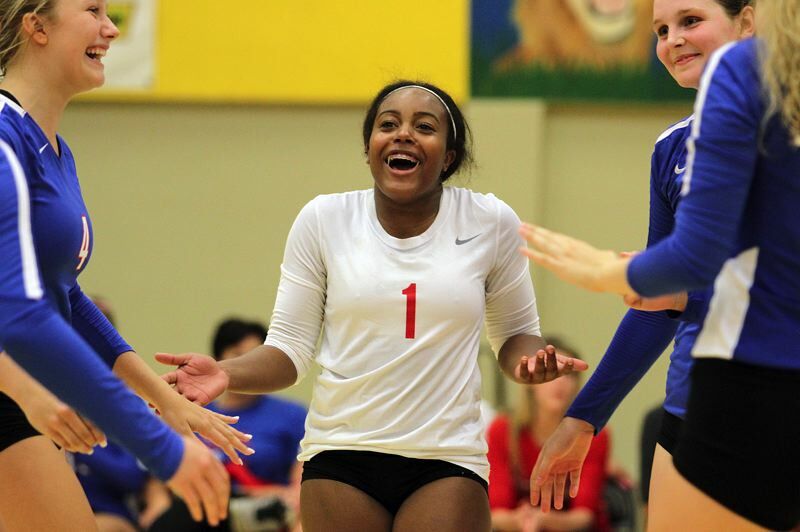 St. Helens, meanwhile, opened with a first-set misfire, but took its best shot in the second and third sets before falling 25-11, 25-16, 25-20 on Aug. 30 at St. Helens High School. "We're coming out, we're looking for the intimidation factor for sure," said La Salle senior outside hitter Madison Hansen, who led her team in kills against St. Helens. "We are going out for big swings, big kills, big blocks — all of it. We're going big." "It felt really good," said La Salle senior setter Emma Hibler. "We really gelled together as a team over the summer and that's our first league match. I'm super excited for the season." With the win, the Falcons improved to 1-0 in NWOC play and moved into a first-place tie with Hillsboro, Putnam and Wilsonville. St. Helens dropped to 1-0 in league with the loss. While disappointed with the loss, the Lions knew they'd played better and showed their ability in the night's final two sets. "I think the first game, we were definitely nervous," said St. Helens senior outside hitter Marissa Eib. "But in the second game, we came out and realized what we needed to do." "I think that after the first game, we kind of figured out where their hitters were hitting and what we needed to do to actually get stuff up to the block," said St. Helens sophomore middle blocker Savannah Moore. The night's first set, however, was pretty much all La Salle. The Falcons opened the night on a 5-0 run served by Maggie Rasch, saw St. Helens close within 6-3 on a kill by Moore, then took off on a 12-3 run served by Hansen (including two aces) to lead 18-4. La Salle then closed out the first set with back-to-back Hansen kills to win 25-11. The second set, however, was a pitched battle that went back-and-forth and featured six ties and four lead changes before the Falcons finally took control midgame. There, they put together a four-point run served by sophomore Margaret Gabrish that made it 12-8. The Lions fought back within 16-13 on a kill by Karlee Webster and a block from Brynn Austin, but got outscored 9-3 the rest of the way. La Salle pulled away to win 25-16 behind Molly Dugan's kill and two aces, and two kills from Gabrish. St. Helens was even tougher in the third set, though, leading 14-10 on a kill from Izy Wallace on the left side, and 17-16 on a crosscourt kill from Webster, a connection in the middle by Webster and a block by Webster. But the Falcons finished strong, outscoring the Lions 9-3 down the stretch, with Hansen collecting three aces and a kill among the night's final eight points. "I saw us a little more tentative, a little more sloppy," Hansen said. "We were running all over the place. We just panicked a little bit — we've just got to keep our composure in games like that." "I love being involved in every play and I'm excited to utilize our amazing offense and defense," Hibler said. "We are super excited for the season." For the Lions, meanwhile, there were plenty of lessons to be learned from their opener. "I think we found out that we need to cover our corners and we definitely need to get faster when we're moving," Moore said. "I think we can have a good year if we just have better attitudes." "You've just got to be ready to dig the passes and make sure your blocks are up at the same time," Eib added. "That's all you can do. I think we just need to start strong and stay strong at the end of the game."